Bimota Forum :: View topic - Classic Bike Japfest. Posted: Tue Dec 04, 2012 3:57 pm Post subject: Classic Bike Japfest. 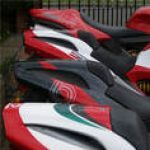 Hello, i hope you will excuse this intrusion onto your Forum, i'm not a Bimota owner but have long admired these bikes and that is why i would like to invite the Bimota enthusiasts to the Classic Bike Japfest. The Taunton and Bridgwater section of the VJMC are holding a Classic Bike Japfest at Haynes Motor Museum, Sparkford, Somerset on September 15th 2013 and we would like to invite you as a club or as individuals to attend. It is a one day show but does have free camping for all exhibitors, the only criteria being is that the bikes must be of Japanese origin and at least fifteen years old. You will also have free entry to Haynes Motor Museum which houses the largest collection of cars in the country. We hope you will attend and look forward to meeting you. Are Bimota's Japanese .... ??? Hi Nick, thats a very interesting invitation from many angles... jap engines at the front I guess! Are they confusing us with the now de-funked enthusiasts circle? Thanks for the replys, obviously it would have to be Japanese engined bikes. Nothing wrong with being labelled enthusiasts, geeks or nerds, i'm probably one, wait till you meet me. No matter what you're labelled you're always welcome at the Japfest. If any of you are going to the Bristol Classic bike show, drop in and say hello, we are in the Sedgemoor Hall under the VJMC banner. There will be flyers and entry forms for the Japfest if you want to show your bike. It would be good to meet some of you and have a chat. My wife refers to me as 'special' so i'm going to take that as a compliment. The GPZ 750 Turbo Club. The Exeter and South Devon Section of the VJMC. The Plymouth and Devon Section of the VJMC. The South Wales Section of the VJMC. The Taunton and Bridgwater Section of the VJMC. Plus many private and individual Exhibitors.